The separatist region of Trans-Dniester - a narrow strip of land between the Dniester river and the Ukrainian border - proclaimed independence from Moldova in 1990, and is considered one of the post-Soviet space's "frozen conflicts". The international community does not recognise its self-declared statehood, and the territory, which remains in a tense stand-off with Moldova, is often portrayed as a hotbed of crime. In a September 2006 referendum, unrecognised by Moldova and the international community, the region reasserted its demand for independence and also backed a plan eventually to join Russia. In the post World War II carve-up of the region, Moscow created Moldova's forerunner, the Moldavian Soviet Socialist Republic, from two disparate elements: the mainly Russian-speaking Dniester region, formerly an autonomous part of Ukraine, and the neighbouring region of Bessarabia, which had been part of Romania from 1918-1940. But in the Soviet Union's dying days, alarm grew in the Dniester region over growing Moldovan nationalism and the possible reunification of Moldova with Romania. A 1989 law which made Moldovan an official language added to the tension, and Trans-Dniester proclaimed its secession in September 1990. The breakaway territory's paramilitary forces took over Moldovan public institutions in the area in 1991. Fighting intensified, culminating in a battle on the right bank of the Dniester in June 1992. Up to 700 people were killed in the conflict. A ceasefire was signed in July 1992, and a 10-km demilitarised security zone was established. The settlement was enforced by the Russian 14th Army forces already stationed in Trans-Dniester. The ongoing presence of Russian troops has been a stumbling block in peace talks and the West is concerned about the Soviet-era arsenal in the territory. A pull-out began in 2001 but was halted when Trans-Dniester blocked the dispatch of weapons. Subsequent agreements to resume failed to reach fruition. Long-running talks supervised by the OSCE, Russia and Ukraine have yet to yield a political solution. Attempts by Moldova to exert economic pressure on the Dniester authorities have failed to produce the desired result. 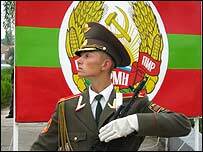 In 2004 a Russian-brokered plan, which would have made the presence of Russian troops permanent, sparked mass protests in Moldova and was shelved. Conflict resolution talks involving Moldova, Trans-Dniester, Russia, Ukraine and the OSCE resumed under Russian mediation in 2008, after being suspended in 2006. There are disputes over language issues. Though dominated by Russian-speakers, around 40% of the population in Trans-Dniester have Moldovan - which is virtually identical to Romanian - as a first language. Trans-Dniester contains most of Moldova's industrial infrastructure, but its economic potential is limited by its international isolation. It has its own currency, constitution, parliament, flag and anthem. One of the last bastions of Soviet-style rhetoric, the territory has nonethless privatised some of its industrial enterprises. Russia shores up the region with financial assistance and funds a monthly payment to the region's pensioners. The region is plagued by corruption, organised crime and smuggling. It has been accused of conducting illegal arms sales and of money laundering. Poverty is widespread. Status: Break-away region of Moldova. Declared independence in 1990. Not recognised internationally. A former speaker of Trans-Dniester's parliament, Yevgeny Shevchuk overturned expectations by coming first in the initial round of voting in the November 2011 presidential election, pushing the incumbent Igor Smirnov into third place. 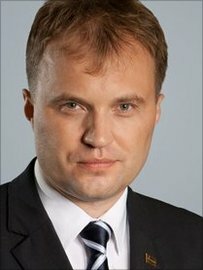 Mr Shevchuk then beat Anatoly Kaminsky, a colleague-turned-rival and Russia's preferred candidate, in the second round to become president in December. Yevgeny Shevchuk broke with long-serving President Smirnov in 2009 in an attempt to limit the latter's powers. He then lead an anti-corruption movement that also called for greater transparency in government. The 43-year-old Mr Shevchuk's election campaign benefited from public weariness with lack of progress in peace talks and general economic stagnation under Mr Smirnov, who had also lost the support of Russia. The new president says he wants to improve relations with Moldova and Ukraine with a view to having them accept Trans-Dniestrian independence, although his shorter-term aim is to ease border travel and trade restrictions. A major priority will be to ensure that Russia continues to support the isolated territory. The separatist authorities exercise tight control over the media. Many outlets are owned either directly by the region's government or by business groups with close links to the authorities. Western governments and media freedom groups say anti-government outlets face serious restrictions, adding that journalists often self-censor. These claims are denied by officials. Television is the most-influential medium. There are two region-wide channels, one government-run and the other owned by a powerful company enjoying strong connections with the authorities. Viewers also turn to European satellite channels and rebroadcasts of the main Russian networks. The press provides a spread of political opinion, although the main dailies are government-owned. Two opposition papers publish less often but are as popular as their official counterparts. General circulation figures are low. The small media market provides content in the region's main languages - Moldovan, Russian and Ukrainian. The government TV broadcasts in each. However, Russian-language outlets predominate.